Key Housing, one of the top providers of San Francisco serviced apartments, has announced a new, informative post about securing difficult to find short-term housing in the Bay Area. The post explores new strategies to find hard-to-find apartments in San Francisco, the second largest city in the Bay Area. San Francisco is a world-class city known as a hub for business and pleasure. To review the new blog post for finding an extended stay apartment in San Francisco, please go to http://blog.keyhousing.com/finding-a-serviced-apartment-san-francisco-is-like-looking-for-a-needle-in-a-haystack/. Information for furnished short-term rentals in the Bay Area can be found. Details about temporary housing locations, such as the featured Strata Mission Bay can also be reviewed at http://www.keyhousing.com/rightside.asp?action=form3&ID=476. Furnished apartments can also be known as serviced apartments or extended-stay corporate apartments. Amenities can include secure parking, concierge and walking distance to restaurants and sightseeing destinations. Finally, those looking to browse available San Francisco apartment listings can visit http://www.keyhousing.com/rightside.asp?location=San%20Francisco. In many cities, searching for a fully furnished temporary apartment may be simple. If the visitor plans to stay in San Francisco, serviced apartments may appear more difficult to acquire. The Bay Area can have a reputation as being expensive for both permanent and temporary housing. Costs can climb further as visitors add up the price for dining out and renting a car. Tourists on holiday or contracted employees may be discouraged by the lack of choices for a serviced apartment in San Francisco. Still, visitors from Europe and other countries may prefer the comfort of a home-away-from-home type of environment. A solution must be found to help contracted employees and out-of-town guests find a perfect match. For these reasons, Key Housing, leaders in sourcing serviced apartments for Northern California, has announced a new blog post. Finding furnished short-term rentals in the Bay Area can be possible and affordable. Budget-conscious visitors may be able to save money on food and travel by renting an extended-stay apartment in the heart of San Francisco’s Mission Bay. Key Housing has also announced Strata Mission Bay as the featured apartment for May 2017. Walking distance to farmers markets and access to a full kitchen can help a food budget. Easy access to public transportation such as the Muni T-Line can help cut costs for car rentals, parking and gas. 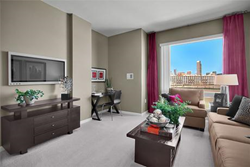 Proximity to Union Square and South of Market can be perfect for sight-seeing adventures. Amenities may also include on-site gym, laundry services, free WiFi and swimming pool. Serviced apartments in San Francisco may seem out of reach, but Key Housing can help visitors find one easier than searching for a needle in a haystack. Reading this post is just one way to get started. Based in Folsom, California, Key Housing Connections Inc. (http://www.keyhousing.com/) specializes in serviced apartments, corporate housing and corporate rentals in large cities like San Francisco or San Jose as well as smaller cities like Fremont and Sacramento. Whether the need is for a serviced apartment in San Francisco or a short term rental in San Jose, just browse our listings to find the rental that fits one’s short term corporate housing needs. We are competitive with extended stay hotels in cities such as Cupertino, Redwood City and Mountain View. Many nurses, interns and people seeking pet friendly corporate rentals or corporate relocation services depend on us for their furnished apartment or other temporary housing needs. Whether after San Francisco corporate housing, short term rentals in Redwood City, or a serviced apartment near Palo Alto, we can aid the search for the right apartment in the Golden State. After all, we're among the top-rated short-term apartment listing service in places San Francisco and just about every city in California. Whether it's serviced apartments or a furnished rental, just search, click or call today!